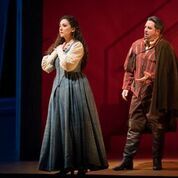 In my three years covering operas at Lyric, I had never seen audience members rise to their feet in rapturous ovation in the middle of the performance, smitten and hungry for more, tears sparkling in some eyes, voices together crying Brava!, but last night soprano Rosa Feola, singing the role of Gilda in Verdi’s Rigoletto, managed that feat. And this was just the icing on a night full of sweet triumphs. Considered the first of Verdi’s masterpieces, Rigoletto tells the story of the vindictive buffoon—half Quasimodo, half overbearing father— who plots murder to avenge his daughter’s sullied honor, with tragic consequences. Baritone Quinn Kelsey as Rigoletto provided a deliciously dark contrast to Feola’s ethereal, bright singing. His voice was like a cauldron full of water over a slow fire that suddenly breaks into a boil. He sang “Cortigiani, vil razza dannata” (“Accursed race of courtiers”) on his knees, with his raw heart metaphorically on his hand, a wounded grief that bled and fell apart with a fury that swept over the theater. Matthew Polenzani’s philandering Duke was equally powerful. When he sung “La donna è mobile” (“Woman is fickle”), the opera’s most recognizable aria, his voice turned into a fire hose spouting the most horrendous misogyny in one of the most seductive and musically satisfying ways. To top things off, Maestro Marco Armilliato, former resident conductor at New York’s Metropolitan Opera, led Lyric’s orchestra to sublime heights. He was welcomed at the beginning of the night like an acquaintance one has heard much about. When he returned to the pit after intermission, he was received like a hero. Under his baton the orchestra became a stallion, powerful in the gallop and majestic in its moments of stillness. The design choices were equally excellent. Constance Hoffman’s sumptuous period costumes glowed in a stylized set by Michael Yeargan that seemed straight out of one of Giorgio di Chirico’s paintings: massive white arches, raked floors, harsh diagonals and bold colors dramatized the ways in which lust, humiliation and the thirst for vendetta deform the character’s minds. Stage director E. Loren Meeker moved all the pieces with a secure and inconspicuous hand, and tied together one of the most solid and satisfying productions at Lyric in recent memory. Rigoletto runs at the Lyric Opera of Chicago through November 3rd. Tickets are available online at www.lyricopera.org. Additional information can be found at www.theaterinchicago.com.